In 1989 a woman named Beth Marks owned a children’s store called Babes in Highland, which was located in the current Dakota J’s storefront on N. Highland Avenue. As a member of the Virginia Highland Merchant Association, Beth was aware of an increase in crime throughout the business district, and volunteered to coordinate a security patrol for the businesses. The association signed a Partners Against Crime (PAC) agreement with the Atlanta Police Department (APD). Included in the agreement was a commitment to assign an on-duty foot patrol officer to the neighborhood. That officer was Chris Clark a three year veteran with the APD. Not long after that crime started spreading from the business corridor into the residential areas of the neighborhood. Beth and her friend, Yvette Weatherly who lived on Glen Arden, decided that they would investigate expanding the patrol into the neighborhood. Beth approached Chris Clark, and he agreed to help get the program started with off-duty APD officers. Thus Fight Back Against Crime or FBAC was born in June of 1990. At the time Beth was on the board of the Virginia Highland Civic Association (VHCA) and approached the board about forming FBAC under the umbrella of the association. For a variety of reasons, the board decided not to participate, so Beth and Yvette along with a few other volunteers decided to move forward on their own. Initially they signed up about 100 households all located north of Virginia Avenue – enough to pay for four to five five hours shifts a week. They set up a checking account to deposit member fees and pay officers, and patrols began. Over the years Beth had a few wonderful volunteers who wanted to contribute, including Elizabeth Watts, who stuffed envelopes, affixed stamps, and generally made life a bit easier for Beth. Keep in mind that in those early days nothing was electronic or automated. Beth sent out renewal notices by mail and people left their membership checks under her front doormat. From the beginning Chris Clark provided strong leadership of the officers hired by FBAC, and served as a strong partner to Beth in building the program. Beth remembered that, “The police used to have pagers (before cell phones). We had codes that the members would use whenever we had to page our officers. There would be a code like 1 was car break in, 2 was house break in, 3 was robbery, etc., and then you would include your street which also had street codes. For example Virginia could have been 01, Maryland could have been 02, and N. Highland could have been 03. Then you put in your house number. When you paged the officers you could put in 203123. Which would have meant house break-in (code 2) on N. Highland (street 03) at 123 N. Highland. Then they knew which house to go to.” Hard to believe today. At some point during the early years another group called Neighbors Eliminating Crime (NEC) was formed south of Virginia Avenue and covering Virginia Circle and Adair between N. Highland and Ponce Place. After a short time it was agreed that NEC and FBAC would merge creating the new boundaries of the FBAC patrol area. Periodically over the years there has been discussion about merging FBAC into VHCA or receiving some funding from VHCA. As recently as 2012 a request was made to VHCA for a grant of $3,600. At the time this represented about 5% of the FBAC annual budget. See Virginia Highland Patch article here. However, the decision has continued to be to keep the two organizations separate. In 2011 Brain Gross (also a VHCA board member) began volunteering with FBAC and made great strides in marketing the program to the neighborhood. As a result, for the first time coverage of the patrol was expanded to cover all of Virginia Highland/beat 601. 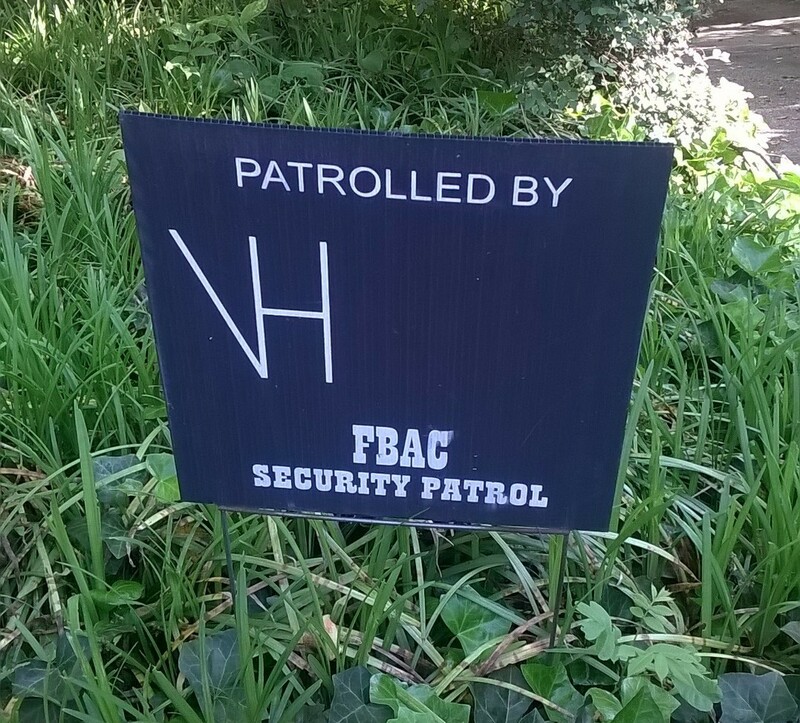 During this same period John Wolfinger, then public safety chair for VHCA and the founder of the Virginia Highland Neighborhood Watch program, also began volunteering with FBAC. After over 20 years of volunteer service, Beth Marks was finally allowed to step down when Nan Safay volunteered to take over bookkeeping duties. Nan, John, and Brian continued to run the program until Brian moved to Mexico City last year. Today the program is coordinated by four volunteers – John Wolfinger, Nan Safay, Jim England, and me, with Sgt. Chris Clark continuing to monitor safety trends and coordinate patrols. The program has continued to operate on a shoestring, with patrol officers using their personal vehicles and paying for their own gas, Chris picking up the tab for a cell phone, and FBAC limiting overhead expenses to less than 1%. Though membership has ebbed and flowed over the years, there was only a brief period of less than a year when membership declined to a point where patrols were suspended. The resultant increase in crime quickly restored membership levels and the patrol has continued to operate ever since. In June 2015 the Virginia Highland Security Patrol will celebrate their 25th anniversary. Few neighborhood groups can boast such longevity. This is also the first year that our membership ranks have exceeded the 300 mark. So next time you see Beth or Chris on the street, walk up and say thank-you. We have them both to thank for one of the strongest neighborhood patrols in Atlanta.